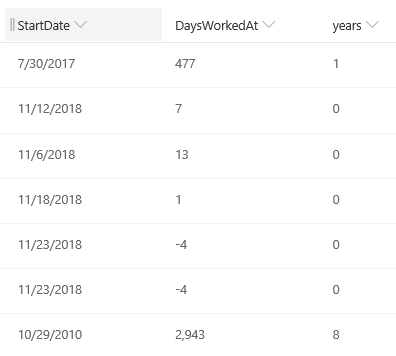 I have an MS Flow workflow attached to the new employee list on new item created, it adds an entry to this list and performs the appropriate work adversaries calculation for the 2 columns mentioned above. Adding a new entry via the interface to the current staff list the calculation works. Adding it via the new employee list through MS Flow the calculated columns has a value of #Name? I can't seem to work out what is causing this or how to fix it. I am using the internal names correctly. I can't find any special characters getting inserted. Attached an image for reference. I found the root cause. It is because the StartDate is greater than Now(). Not the answer you're looking for? Browse other questions tagged sharepoint-online calculated-column date-time ms-flow or ask your own question.